HY&T RAIL ROAD They called the hard-working little train, "The Dummy," probably in derision after they realized it would never live up to their original high hopes. But when the gallant little railroad died, an era ended for Hooppole, about 30 miles NE of Moline and points NE to Tampico, IL. In the beginning, the citizens of Hooppole had such faith in the dream that was built around the railroad that they turned the entire town around in 1909 to be ready for the boom that was sure to come. They held on to the railroad for 46 years. But when it finally quit in 1954, the turned-around town was not much bigger than it was in the beginning and the high hopes were worn as thin as the seedy, cinder-blackened roadbed that held the gleaming rails of the shortest railroad in the midwest. Today, it's all just a memory. The rails were ripped up and sold for scrap iron; farmers dug up the cross ties and used them for fence posts; the roadbed was plowed up and planted to crops. The engine and boxcars were turned back to the Burlington Railroad. And someone burned the once bright little red caboose. Asphalt bonding the concrete poured over the old HY&T tracks crossing Rte. 172 outside Tampico, is a reminder of the crazy quilt pattern of the righ-of0way. The tracks zig-zagged back and forth over this stretch of highway three times in four miles. "It's the end of the line for all of us who were in on it in the beginning, I guess," Howard Mathis of Hooppole, said nostalgically. "The first engineer is dead, the guy who promoted it was up in years when he sold us on the thing, and the people who bought the first stock are dead. Even the railroad is gone. I'm about the only one left, except for George, the station agent in Tampico, and he's not working for the railroad there anymore." Mathis held the railroad together for a decade after the original company ran out of money and the little 14-mile HY&T was doomed to oblivion. The dream was born in 1908 when a big-city promoter, JJ Burns, turned up in the Hooppole country selling stock to build a railroad across country from Tampico to Galesburg. The proposed line would connect the Burlington Railroad to the north with the Rock Island lines to the south. It sounded great to many fo the farmers and townspeople in Tampico, Yorktown and Hooppole, and $100,000 worth of stock at $100 per share was sold. The Hooppole, Yorktown and Tampico (HY&T) Railroad Co. was formed with Oberg Mathis, a relative of Howard's, president and R.H. Mathis, secretary. The investors began acquiring a right of way and the glittering dream of the HY&T hit its first snag. Many of the farmers along the planned route owned stock in the company, and some of them sold or donated land for a right-of-way. Other farmers wanted no part of the venture and refused to let the railtoad cross their fence lines. So the HY&T wound through the country as it could. The route was a crazy pattern that felt its way across the land of friendly farmers until it could connect with other compatible landholders. It ran straight for a while, then curved in great, looping arcs, and in one place just outside Tampico zig-zagged sharply back and forth across the highway (route 172), three times in a four-mile stretch. The tracks entered Tampico down the main street, a pleasant thouroghfare lined with large, gracious houses and great spreading trees. Contracts were let and horse-drawn machinery bit into Illinois prairies and rich farm land. The dream stirred to life as gleaming rails snaked from Tampico toward Hooppole. Meanwhile, people in Hooppole realized their town would be the end of the line for some time to come and the idea grew that it was destined to become a bustling rairoad center in the near future. In those days, the main street ran east and west and the business district was somewhat removed from where the depot was being built and trains would enter the town. The people decided to turn the town around, run main street north and south to make the new railroad terminal the hub of the city they felt was someday soon to be. So they did. The tracks were laid and HY&T officials went scouting for rolling stock. They got an engine from the Burlington Railroad, on loan, came up with a couple of boxcars and a bright red caboose. They also had a rich freight contract with the Burlington and the future looked rosy indeed. On April 24, 1909, amid great pomp and circumstance, the first train rolled out of Tampico headed for the end of the line, newly turned-around Hooppole. The caboose held the passengers. The engineer, Ed Anderberg, also fired the boilers. The train rolled through railroad points like Aliceville and Love Center. The dream was reality. Next would be its gowth into the commercial giant that JJ Burns had convinced them was bound to be. The railroad consisted of one train with an engine, one to two boxcars, and the caboose, which also doubled as passenger car. It ran six days each week, knocking off on Sunday so the engineer could go to Church in Tampico, where he lived with his family. The train left Hooppole in the neighborhood of 8:30 to 10:00 a.m. "depending on when the passengers were all loaded and the freight was in the boxcars." It returned anywhere between 3:30 and 7:00 p.m., "depending on how much stuff there was to pick up to haul back and how many passengers were late catching the train." Freight included harvessted crops, ice, sand, gravel, lumber, road building material "and anything else folks needed the train could carry." Howard Mathis, 86, used part of the cross ties to build his farm fence and explains, "It's all gone now, the railroad and the people who got it going. I'm about the only one left..." he stated as he was interviewed. There was no roundhouse at the end of the line, so the train ran forward on the run to Hooppole, then the engine was switched by hand and the train ran backwards to Tampico. As the railroad grew in stature along its 14-mile line, so did its problems. The housewives in Tampico were up in arms. the train puffing in along the main street begrimed their crisp white curtains, made their clean houses stink and the noise alarmed the children. Their outrage was so great, pressure forced the HY&T to rip up the tracks and move over two blocks for a different entry route. A disgruntled farmer vowed the HY&T had made its last trip across his land and pounded a line of stout posts right down the middleof the tracks, removing them only under threat of dire court action and promises of other less orderly reprisals. A feud developed between the tiny HY&T and the behemoth Rock Island line that made railroad history in a wild sort of way. The Rock Island refused to let its cars roll over HY&T tracks. Freight destined for points north was unceremoniously dumped on the ground at the end of the Rock Island tracks to be laboriously reloaded on "The Dummy's" boxcars, Mathis recalled. 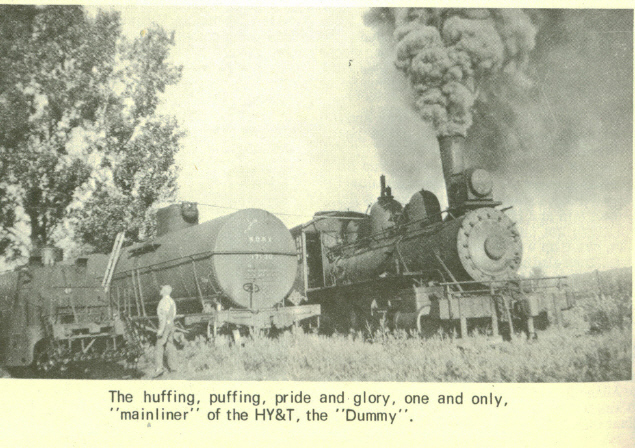 In revenge, the HY&T routed all possible freight business to the Burlington. Businessmen along the route ordered out-of-state shippers of lumber and other large items to by-pass Rock Island cars and use those of other rairoads and ship via Burlington lines. Problems compounded when the engine house in Hooppole burned down. But the little railroad continued to thrive. Large corn storage cribs sprouted along the tracks to load newly harvested grain. Livestock pens sprang up and cattle, horses, sheep and swine were hauled along the shipping rails. Passengers, in spite of the erratic timetable, continued to put down 50 cents for fare from Hooppole to Tampico and 25 cents from points closer in. It was a custom for passengers to tip one engineer on the line $1.00 at debarcation. these gratuities were called "dice tips." It seemd the engineer loved to shoot dice while he was waiting for the train's return trip from one point to another and the tips financed his favorite indoor sport.